Knitted proudly 100% by hand making it an honest and hard-to-find one of a kind creation. Makes a unique handmade gift idea for women and teens! Ships from Bolivia. BARBERY Perfection Yarn Blend: 50% Alpaca Natural Fiber, 25% Wool, 25% Acrylic. 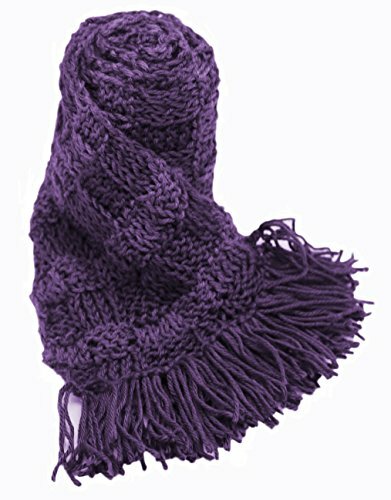 Creative combination of two shades of yarn: purple and lavender! THIS IS A CUATOM MADE ORDER! You can also change the color/color combination. Requires gentle hand-wash and spot-cleaning. Dry-cleaning with experienced facility on natural fibers. If you have any questions about this product by BARBERY Alpaca Accessories, contact us by completing and submitting the form below. If you are looking for a specif part number, please include it with your message.